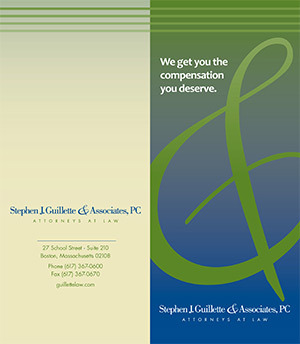 About Us – Stephen Guillette & Associates P.C. Attorney Stephen J. Guillette is an active member of the American Bar Association, the Boston Bar Association, and the Massachusetts Academy of Trial Attorneys. His practice focuses on personal injury, landlord-tenant and social security disability law. After receiving a degree from Northeastern University, Attorney Guillette went to work for insurance carriers Aetna Property and Casualty, John Hancock Property & Casualty, Fireman’s Fund Insurance Company, and Budget Rent A Car Systems, Inc. handling serious injury claims. Then, with this unique experience in his back pocket, Attorney Guillette began a law practice focused on aiding victims of serious personal injury. Attorney Guillette has handled hundreds of personal injury cases, including wrongful death and serious motor vehicle and work-related injuries. His experience in this field, combined with his diligence and attention to detail make him a stand out in the Greater Boston legal community.